Dan and Tina live in Raleigh, NC. They wrote: “Dan and I started fostering in order to help save beagle lives and give them a warm home to rest and heal. 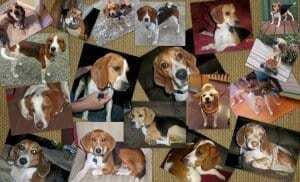 We have helped many beagles get prepared for a forever home. Our first foster “Shamus” was the hardest to let go to a forever home, but with strength and faith we were able to let go. We then learned he was happy and healthy and loved his new home, now more the 5 years. This gave us motivation to continue to foster and we became hooked. Our fosters have helped use through hard times as well. It is not an easy responsibility, but it is a great one. We have many roles with TBR and by far fostering is the most rewarding and motivating. It is not easy to say what is the average time a dog stays in foster care. On average we have had our Beagles stay about 3 to 5 months. Some we have had for 1 week and others for months. Our hardest to let go were with us for 1 yr. to 3 yrs. For example we fostered Uma and Pinto for a year. We were able to find Uma’s soulmate. Pinto now has a great and loving home with a very valuable volunteer with TBR. Our biggest success was fostering Roxie. She was with us for 3 years. She came to us scared of everything. She was unable to walk on a leash, be in the room with the family without shaking and hid most of the time. After getting support from her foster siblings and Dan and I, Roxie grow and became more confident. We did realize she had reached her potential with us so we continued to look for a home for her. Sure enough we found the Ghent family. They have giving her opportunities to continue to grow. She is now a “ROCK STAR”. All my fosters are rock stars in our eyes. That is why today we continue to foster. Thank you so much Dan & Tina for opening your hearts and homes to ALL of these gorgeous foster beagles!